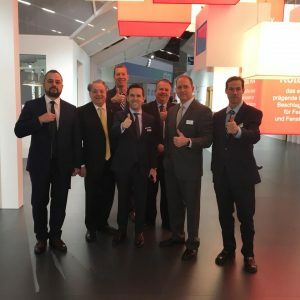 Roto Frank debuted new products at the 2018 Fensterbau Frontale trade show, held during March 21-24 in Nuremberg, Germany. The 12,000 square foot Roto Frank exhibit drew a steady crowd throughout the entire show, with over 3,000 visitors per day. One of the innovative new products at the booth was the Roto NX, which showcased its advantages of efficiency, security, comfort, and design. Roto NX hardware allows our customers to meet future needs (increased ease of installation, reduced item and storage requirements, more convenient functionality, and a higher-grade appearance) of European windows and doors with Roto. “This is an evolution of the most sold tilt and turn system in the world,” said Chris Dimou, Roto’s North-America CEO & President of the Americas. “Improved ease of assembly and installation by reducing the complexity of the hardware system leads to the highest operating convenience for our customers and assurance that using the Roto NX is always the right decision,” said Bountzouklis. Also generating excitement among visitors was the Roto Patio Inowa, a hardware solution for sliding patio doors designed to provide high thermal- performance levels. The system offers a continuous gasket around the operable sash and concealed lock points, even in the mullion area where the sashes come together.